Today’s readings call us to look deep within ourselves and recognize our mistakes, as difficult as this introspection may be. It is so easy to violate God’s commandments and to take actions contrary to those God asks us to take. The first reading reminds me of the daunting feeling I sometime feel after making my examination of conscience before receiving the sacrament of reconciliation. Feelings of regret and unworthiness come to mind. But, as the Psalmist tells us, the Lord forgives and has compassion on us, even though we may not have fulfilled what we have been asked to do. We must ask for the Lord’s assistance and mercy as our Savior and truly believe in the love the Lord has for us. The bottom line is that the Lord has unconditional love for each and every one of us. At the end of the day, we are human beings, living in a world that is often ruled by evil. There is however, an opportunity for each and every one of us to resist temptation and take a different path such as participating in a generous act you wouldn’t otherwise or resisting degrading an individual. Let us ask for the Lord’s mercy and to bestow His strength on each and every one of us. 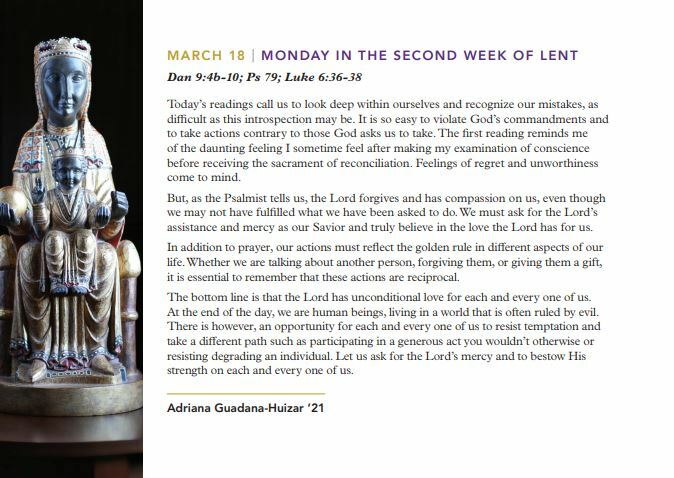 Read the full Lenten Reflections publication from College of the Holy Cross on their website, today!